Experience G&D live in London and Dubai. When broadcasters choose new technical equipment, they don’t just consider the technical parameters of a product. It is rather the interplay of quality, functionality and technical consulting that provide the decisive impulse for solving complex challenges. For decades, the Guntermann & Drunck GmbH has been extremely successful with focusing on these aspects – only one of the reasons why the company is the leading manufacturer of KVM products for broadcast applications around the world. At BVE 2017 and CABSAT 2017 trade fair visitors will be able to experience a number of powerful highlights to help users get the maximum out of every IT installation. On top of this, they will get personal advice from G&D’s KVM specialists – and therefore everything a powerful product requires beyond pure specifications. The DP1.2-VisionXG is a KVM extender of superlatives, which allows uncompressed and latency-free transmission of 4K and 8K video at 60Hz. The KVM extender system consists of a computer module and a user module. It allows users to operate their computers remotely while benefitting from the pixel-perfect, uncompressed transmission of high-resolution DisplayPort video over distances of up to 10,000m. This ensures a perfect hand-eye coordination and best video quality. Dedicated transmission takes place over fibre optics to provide sufficient bandwidth for uncompressed DisplayPort 1.2 signals, video, keyboard/mouse, RS232, USB 2.0 and audio. 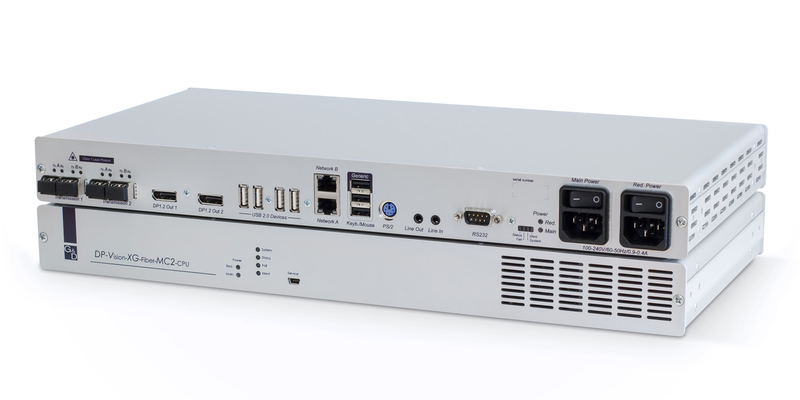 The system includes many user-friendly and mission-critical features such as the screen-freeze function, the monitoring function, a redundant power supply, SNMP and two network ports. KVM extender DP1.2VisionXG for perfect video transmission, pixel by pixel up to 8K at 60 Hz. Another highlight at the G&D stand will be the presentation of compressing systems, which now include G&D’s improved, in-house HDIP compression technology in the latest development stage, Level 3. This compression mode allows the loss-free transmission of video signals with a resolution of 4K at 60Hz. 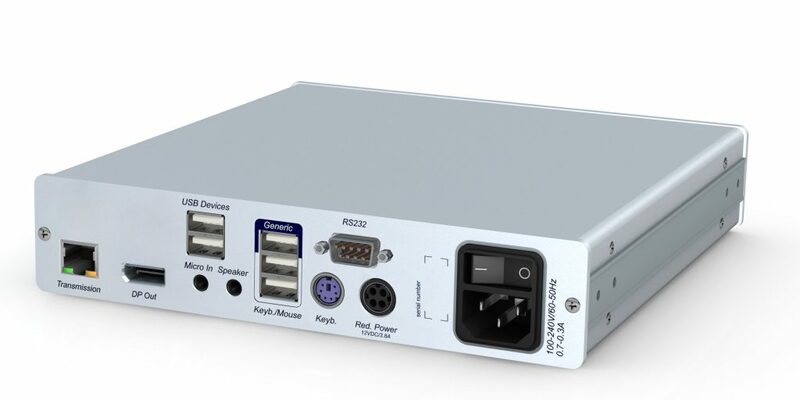 The KVM extender DP-Vision1.2 already uses the advantages of this new compression mode for the extension of computer signals either via fibre optics up to 10,000 m or via CAT cables up to 140 m.
DP-Vision KVM extender: Data transmission over fibre optics or classic CAT cables. The scenario becomes even more exciting when it comes to extending computer signals not only as a point-to-point connection, but when these signals are also switched and distributed – or in other words, when several computers are to be operated remotely via different, simultaneous workstations. Following G&D’s principle of mix & match, all products as well as their variants are compatible and can be combined with each other. The KVM extender DP1.2-Vision can easily be integrated into G&D matrix systems such as the ControlCenter-Compact or the ControlCenter-Digital, which allows the extension and switching of 4K at 60 Hz through the matrix. The ControlCenter-Compact is available in six expansion levels providing between 8 and 80 dynamic ports, which can be used either as input or as output. The device is compatible with both the DVICenter and the ControlCenter-Digital as well as all end devices, which makes it possible to add new systems to existing infrastructures. G&D’s matrix switches include many useful and helpful functionalities such as CrossDisplay-Switching and scenario switching. The KVM Matrix-Grid™ further enhances the possibilities of interconnecting distributed IT structures. At different locations different matrix systems can be integrated into a system, resulting in a large, virtual, reliable matrix system, which can be expanded flexibly. Another useful feature – the monitoring function – allows administrators to monitor and maintain both computer modules and user modules as well as the central matrix. Trade fair visitors can look forward to experiencing this and many other features as the most important addition to pure technical specifications. 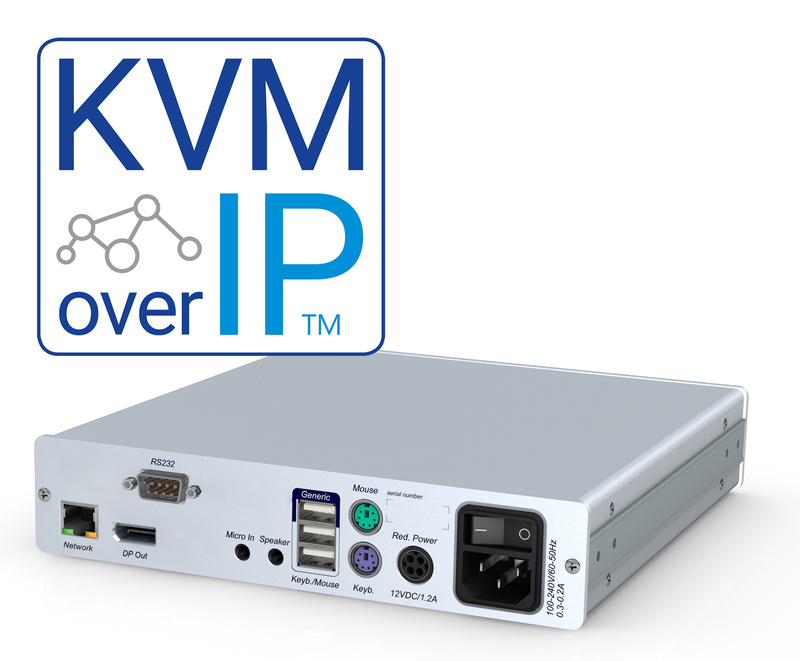 Based on IP structures, the new KVM extender DP-Vision-IP complements G&D’s portfolio and breaks any spatial limitations that existed so far. The system supports DisplayPort video resolutions up to 2560 x 1600 @ 60 Hz or 3840 x 2160 @ 30 Hz. Combinations with other G&D systems are also possible thus allowing complex installations with worldwide access. With the DP-Vision-IP, G&D are significantly expanding their portfolio and currently offer the broadest range of KVM systems available on the market. DP-Vision-IP for unlimited access over IP. G&D KVM systems help create user-friendly, ergonomic and efficient workstations without any computers and free from noise and heat emissions. These ideal working conditions make both humans and computers more productive. Storing the computers in central equipment rooms makes it easier for technicians to administrate and maintain the devices. Many national and international TV stations and broadcasters trust in G&D’s 30 years of experience of manufacturing mission-critical KVM systems. In London and Dubai the trade fair visitors will be able to experience these and other high-end KVM products live to find the best possible solution for their application.